Prosecuting big banks and senior bankers is hard for many reasons: they hire big name lawyers that fight tooth and nail, with delays, deviations and imaginable and unimaginable obstructions of all sorts. PR firms are hired to deviate and create smoke and mirrors. And some journalists seem easily to identify with the pillars of financial society, even talking about “victimless crime.” All of this springs to mind regarding the SFO charges against John Varley former CEO of Barclays and three senior managers – where an Icelandic parallel can possibly throw some light on the few facts in the case of Varley e.al. In the summer of 2008, as liquidity was tight for many banks, two high-flying banks in the London business community, Barclays and Kaupthing, were struggling. Both sought salvation from Qatari investors. Not the same investors though the name al Thani, a ruling clan in the dessert state of Qatar, figures in both investment stories. In 2012 as the Icelandic Office of the Special Prosecutor, OSP, brought charges against three Kaupthing managers and the bank’s second largest investor Ólafur Ólafsson, related to Qatari investment in Kaupthing in September 2008, the British Serious Fraud Office, SFO, was just about to start an investigation into the 2008 Qatari investment in Barclays. In 2015 the four Icelanders were sentenced to 4 to 5 1/2 years in prison for fraudulent lending and market manipulation (see my overview here). SFO is now bringing ex CEO John Varley and three senior Barclays bankers to court on July 3 on the basis of similar charges. As the first UK bankers are charged for actions during the 2008 crisis such investigations are coming to a close in Iceland where almost 30 bankers and others have been sentenced since 2011 in crisis-related cases. The Kaupthing charges in 2012 filled fourteen pages, explaining the alleged criminal deeds. That is sadly not the case with the SFO Barclays charges: only the alleged offences are made public. Given the similarities of the two cases it is however tempting to use the Icelandic case to throw some light on the British case. SFO is scarred after earlier mishaps. But is the SFO investigation perhaps just a complete misunderstanding and a “victimless crime” as BBC business editor Simon Jack alleges? That is certainly what the charged bankers would like us to believe but in cases of financial assistance and market manipulation, everyone acting in the financial market is the victim. These crimes wholly undermine the level playing field regulators strive to create. Do we want to live in a society where it is acceptable to commit a crime if it saves a certain amount of taxpayers’ money but ends up destroying the market supposedly a foundation of our economy? When the Icelandic state prosecutor brings charges the underlying writ can be made public three days later. The writ carefully explains the alleged criminal deeds, quoting evidence that underpins the charges. Thus, Icelanders knew from 2012 the underlying deeds in the Icelandic case, called the al Thani case after the investor Sheikh Mohammed bin Khalifa al Thani who was not charged. The Gulf investors named in 2008 were Sheikh Hamad bin Jassim bin Jabr al Thani, Qatar’s prime minister at the time and Sheikh Mansour bin Zayed al-Nahyan of Abu Dhabi. The side deals the bankers are charged for relate to the Qatari part of the investment, i.e. Barclays capital raising arrangements with Qatar Holding LLC, part of Qatar’s sovereign wealth fund and al Thani’s investment vehicle Challenger Universal Ltd and $3bn loan issued by Barclays to the State of Qatar, acting through the Ministry of Economy and Finance in November 2008. The Barclays saga is allegedly that apart from the Qatari investments in Barclays in June and October 2008, in total £6.1bn, there were two side deals, allegedly financial assistance: Barclays promised to pay £322m to Qatari investors, apparently fee for helping Barclays with business development in the Gulf; in November 2008, Barclays agreed to issue a loan of $3bn to the State of Qatar, allegedly fitting the funds prime minister Sheikh al Thani invested, according to The Daily Telegraph. Thus it seems the Barclays bankers (all four following the June 2008 investment, two of them following the October investment) were allegedly misleading the markets, i.e. market manipulation, when they commented on the two Qatari investments. If we take cue from the Icelandic al Thani case it is most likely that the Barclays managers begged and pestered the Gulf investors, known for their deep pockets, to invest. In the al Thani case, the Abu Dhabi sovereign wealth fund had earlier considered buying Kaupthing shares but thought the price was too high. Kaupthing then wooed the Qatari investors with some good offers. What Kaupthing promised was a “risk-free” loan, a classic Kaupthing special offer to special clients, to place as an investment in Kaupthing. In other words, there was never any money coming into Kaupthing as an investment. It was just money merry-go-round from one Kaupthing account to another: funds going out as a loan and coming back as an investment. In addition, the investors got a loan of $50m directly into their pockets, defined as pre-paid profit. Barclays hardly made such a crude offer to the Qatari investors but the £322m fee leads the thought to the pre-paid profit in the Kaupthing saga; the Barclays fee could allegedly be defined as pre-payment for services-to-come. The $3bn loan to the state of Qatar is intriguing, given that the state of Qatar is and the finances of its ruling family have allegedly often seemed closely connected. The September 2008 Qatari investment in Kaupthing figured in the 2010 report of the Special Investigative Commission, SIC, a report that thoroughly explained and mapped the operations of the Icelandic banks up to the 2008 collapse. The criminal case added details to the SIC saga. It is for example clear that Kaupthing didn’t really expect the Gulf investors to pay back the investment but handed them $50m right away. Little is yet known about the details of the alleged Barclays side deals. How were the covenants for the $3bn loan? Has this loan been repaid or is it still on Barclays books? And was the service for the £322m ever carried out? Was there any specification as to what Barclays was paying for? Why were these services apparently pre-paid instead of being paid against an invoice after the services had been carried out? These are some of the things we would need to know in order to assess the side deals and their context and connections to the Qatari investment in Barclays. Clearly, the SFO knows and this will no doubt be part of the coming court case. The Kaupthing resolution committee went after the Qatari investors to recover the loans, threatening them with legal proceedings. Investigators from the Office of the Special Prosecutor did question the investors. According to Icelog sources, the Qatari investors were adamant about clarifying the situation both with Kaupthing and the OSP. The understanding was that the investors were worried about their reputation. They did in the end reach a settlement with the Kaupthing resolution committee as Kaupthing announced in 2013. These two investment sagas do however leave a certain whiff. In August last year, when it transpired that Qatari investors had invested in troubled Deutsche Bank I sent a query to Deutsche’s spokesman asking if the bank was possibly lending the investors money. I got a stern reply that I was hinting at Deutsche committing a legal offense (well, as if Deutsche had not been found to have rigged markets, assisted in money laundering etc) but was later assured that no, Deutsche had not given any financial assistance to its Qatari investors, no side deals related to their investment in the bank. Although certainly not the only one, Barclays is a bank with a long register of recent financial sins, inter alia: in 2012 it paid a fine of £290m for Libor manipulation; in 2015 it paid £2.3bn for rigging FX markets and £72m to settle money laundering offenses. As to lessons learnt: this spring, it turned out that Barclays CEO Jes Staley, has broken whistleblower-rules by trying to unmask a Barclays whistleblower. CEOs have been remarkably short lived at Barclays since Varley left in 2010: his successor Bob Diamond was forced out in 2012, replaced by Antony Jenkins who had to leave in 2015, followed by Jes Staley. In spite of Barclays being fined for matters, which are a criminal offence, the SFO has treated these crimes (and similar offences in many other banks) as crimes not committed by people but companies, i.e. no Barclays bankers have been charged… until now. After all, continuously breaking the law in multiple offences over a decade, under various CEOs indicates that something is seriously wrong at Barclays (and in many other big banks). Normally, criminals are not allowed just to pay their way out of criminal deeds. In the case of banking fines banks have actually paid with funds accrued by criminal offences. Ironically, banks pay fines with shareholders’ money and most often, senior managers have not even taken a pay cut following costs arising from their deeds. In all its unknown details the Barclays case is no doubt far from simple. But compared to FX or Libor rigging, it is manageable, its focus being the two investments, in June and October 2008, the £322m fee and the November 2008 loan of $3bn. Instead of seeing the merit in this heroic effort by the SFO BBC’s business editor Simon Jack is greatly worried, after talking to what only appear to be Barclays insiders. There is no voice in his comment expressing any sympathy with the rule of law rather than the culpable bankers. Jack asks: Why, over the past decade, has the SFO been at its most dogged in the pursuit of a bank that DIDN’T require a taxpayer bailout? In fact, it was Barclays’ very efforts to SPARE the taxpayer that gave rise to this investigation. This is of course exactly the question and answer one would hear from the charged bankers but it is unexpected to see this argument voiced by the BBC business editor on a BBC website as an argument against an investigation. In the Icelandic al Thani case, those charged and eventually sentenced also found it grossly unfair that they were charged for saving the bank… with criminal means. Jack’s reasoning seems to justify a criminal act if the goal is deemed as positive and good for society. One thing for sure, such a society is not optimal for running a company – the healthiest and most competitive business environment surely is one where the rule of law can be taken for granted. Another underlying assumption here is that the Barclays management sought to safe the bank by criminal means in order to spare the taxpayer the expense of a bailout. Perhaps a lovely thought but a highly unlikely one. There were plenty of commentaries in 2008 pointing out that what really drove Barclays’ John Varley and his trusted lieutenants hard to seek investors was their sincere wish to avoid any meddling into Barclays bonuses etc. Is the alleged Barclays fraud a “victimless crime”? It’s worth remembering that taxpayers didn’t bail out Barclays and small shareholders didn’t suffer the massive losses that those of RBS and Lloyds did. One former Barclays insider said that if there was a crime then it was “victimless” and you could argue that Barclays – and its executives – did taxpayers and its own shareholders a massive favour, writes Jack. It comes as no surprise that “one former Barclays insider” would claim that saving a bank, even by breaking the law, is just fine and actually a good deed. For anyone who is not a Barclays insider it is a profound and shocking misunderstanding that a financial crime like the Barclays directors allegedly committed is victimless just because no one is walking out of Barclays with a tangible loss or the victims can’t be caught on a photo. We don’t know in detail how Barclays was managed, there is no British SIC report. So we don’t know if the $3bn loan has been paid back. If it was not repaid or had abnormally weak covenants it makes all Barclays clients a victim because they will have had to pay, in one way or another, for that loan. Even if the loan was normal and has been paid a bank that uses criminal deeds to survive turns the whole society into the victims of its criminal deeds: financial assistance and market manipulation skew the business environment, making the level playing field very uneven. Pushing Jack’s argument further it could be conclude that the RBS and Lloyds managers at the time did evil by not using criminal deeds to save their banks, compared to the saintly Barclays managers who did – a truly absurd statement. Charging those at the top compared to charging only the “arms” of the top managers, i.e. those who carry out the commands of senior managers, shows that the SFO understands how a company like Barclays functions; making side deals like these is not decided by low-level staff. Further, again with an Icelandic cue, it is highly likely that the SFO has tangible evidence like emails, recordings of phone calls etc. implicating the four charged managers. Criminal investigations are partly to investigate what happened, partly a deterrent and partly to teach a lesson. If the buck stops at the top, charging those at the top is the right thing to do when these managers orchestrate potentially criminal actions. But those at the top have ample means to defend themselves. Icelandic authorities now have a considerable experience in prosecuting alleged crimes committed by bankers and other wealthy individuals. And Icelanders also have an experience in observing how wealthy defendants react: how they try to manipulate the media via their own websites and/or social media, by paying PR firms to orchestrate their narrative, how their lawyers or other pillars of society, strongly identifying with the defendants, continue to refute sentences outside of the court room etc. And how judges, prosecutors and other authorities come under ferocious attack from the charged or sentenced individuals and their errand boys. All of this is nothing new; we have seen this pattern in other cases where wealth clashes with the law. And since this is nothing new, it is stunning to read such a blatant apology for the charged Barclays managers on the website of the British public broadcaster. Even if the SFO prosecution against the Barclays bankers were to fail apologising the bankers ignores the general interest of society in maintaining a rule of law for everyone without any grace and favour for wealth and social standing. Those four charged were Sigurður Einarsson chairman of Kaupthing board, Magnús Guðmundsson manager of Kaupthing Luxembourg, Kaupthing CEO Hreiðar Már Sigurðsson and Ólafur Ólafsson the bank’s second largest shareholder. Reykjavík District Court had earlier ruled in the case where Einarsson was sentenced to 5 years in prison, Guðmundsson 3 years, Sigurðsson 5 1/2 years and Ólafsson 3 1/2 years. The Supreme Court has confirmed the ruling over Sigurðsson whereas Ólafsson has now been sentenced to 4 1/2 years, Einarsson to 4 years instead of 5 years and Guðmundsson to 4 years. 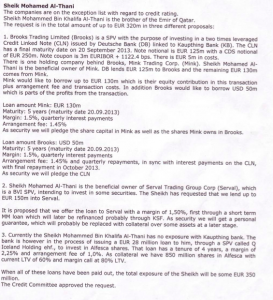 As detailed in an earlier Icelog the core of the al Thani case were loans to Ólafsson and Sheikh Mohammed bin Khalifa al Thani, a Qatari investor from the country’s ruling family. It is important to notice that the issuing of these loans was the criminal deed in the case – the three Kaupthing managers broke law by doing it and Ólafsson was complicit in that criminal deed. The story behind the case is that in in September 2008 Kaupthing made much fanfare of the fact that Sheikh al Thani bought 5.1% of Kaupthing’s shares. The 5.1% stake in the bank made al Thani Kaupthing’s third largest shareholder, after Olafsson who owned 9.88%. This number, 5.1%, was crucial, meaning that the investment had to be flagged – and would certainly be noticed. Einarsson, Sigurðsson and Ólafsson all appeared in the Icelandic media, underlining that the Qatari investment showed the bank’s strong position and promising outlook. What these three didn’t tell was that Kaupthing lent al Thani the money to buy the stake in Kaupthing – a well known pattern, not only in Kaupthing but in the other Icelandic banks as well. 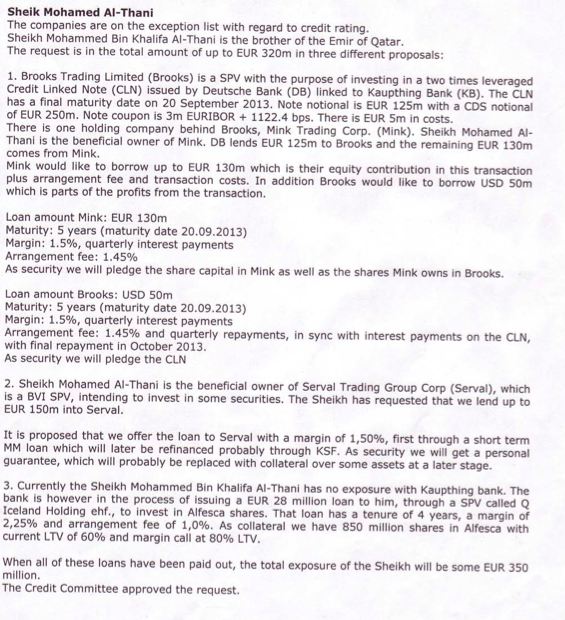 A few months later, stories appeared in the Icelandic media indicating that al Thani was not risking his own money. More was told in SIC report and the SIC recount indicated a fraudulent behaviour. The ruling today has confirmed the doubts, which have surrounded this investment from early on. Although the case draws its name from Sheikh al Thani he has not been accused of any wrongdoing. He was one of the witness in the case, gave a statement over the phone. As I have pointed out earlier there is an echo of this investment story in the ongoing investigation into Qatari and Middle East investment in Barclays, which saved the bank from seeking state support in autumn 2008. The ruling in Iceland is i.a. in stark contrast to how Irish courts have tackled financial crimes related to the Irish collapsed banks. In April last year a court ruled that two former Anglo Irish managers, who had been convicted of issuing loans to prop up the bank’s share price, should not be imprisoned in spite of being found guilty. The judge ruled it was unjust they should go to prison for a criminal deed because they believed they had acted lawfully. Sean FitzPatrick, the bank’s former chairman, was cleared in this case. I find this Irish ruling truly incredible. This loan saga – loans to the so-called “Golden Circle” – has striking parallels in other Icelandic cases, which are being processed. Icelandic law on financial fraud is in most respect similar to law on these issues in Northern Europe. There is nothing special about the Icelandic situation – except the will to carry out investigations and bringing cases to court. As Hauksson pointed out financial crimes need not be too complicated to be successfully prosecuted – and no part of society should be beyond the reach of the law. *Update: I have seen some comments that because the four sentenced to prison in the al Thani case are living abroad they are unlikely to go to prison. That is not correct: the fact that they live abroad – in London, Switzerland and Luxembourg – will apparently not change anything. Ólafsson has already said he will come when called to go to prison. That is an unavoidable consequence of the sentencing. *Update 25.2. 2015: Ólafsson asked to start his sentencing as soon as possible. According to Icelandic media he is now already in prison at Kvíabryggja, Snæfellsnes, where this sentenced in earlier banking collapse cases have been sent to jail (see here for details of this prison). A ruling in the so-called al Thani case is expected today at 3pm in Iceland. The Office of the Special Prosecutor earlier charged Kaupthing top managers – Sigurður Einarsson, Hreiðar Már Sigurðsson, Magnús Guðmundsson – and the second largest Kaupthing shareholder, Ólafur Ólafsson, for market manipulation and breach of fiduciary duty. The case derives its name from a member of the Qatar-ruling al Thani family, involved in the case but not charged. Involving both management and a shareholder this case is one of the most extensive cases brought by the OSP. So far, the District Court has tended to be more lenient than the Supreme Court in cases brought by the OSP. All of the OSP cases have gone to the second and highest court, the Supreme Court. No matter the outcome, this case will almost certainly be appealed by either party. The OSP had demanded a six year unsuspended imprisonment for Einarsson and Sigurðsson and four years for the other two. See here for earlier Icelogs on the al Thani case. UPDATE: Sigurðsson has been sentenced to 5 1/2 years, Einarsson 5 years, Ólafsson 3 1/2 years and Guðmundsson 3 years. The al Thani case has taken yet another unexpected turn – it seems that there are only unexpected turns in this case. Instead of postponing the oral hearing until February next year, as Justice Pétur Guðgeirsson of Reykjavík County Court had decided after a meeting with the new defence lawyers, the case will be assigned to a new judge, Símon Sigvaldason. Guðgeirsson will be off due to illness. The oral hearing is now set to start 21 October. The Office of the Special Prosecutor and the defendants heard of this yesterday, according to Rúv. The al Thani case relates to the share purchase of a Qatari investor from Qatar’s ruling family. He bought 5.1% of shares in Kaupthing in September 2008. It later transpired that Kaupthing financed the purchase. The case has strong parallels to a Qatari investment in Barclays in autumn 2008, saving the bank from seeking a bail-out from the UK Government (link to earlier Icelogs on the al Thani case). This is the latest in a long wrestle over bringing the al Thani case to court. As reported earlier, the defense team of Sigurður Einarsson chairman of Kaupthing and Ólafur Ólafsson, the bank’s second largest shareholder, had used up all possibilities to have the case thrown out or postponed when they brought about a delay by simply resigning from the case and then refusing to obey the judge when he refused to accept their resignation. The fact that the court itself has now taken action to diminish the delay indicates that further delaying tactics might prove more difficult. Those following the prosecution of bankers in Iceland are no doubt in for some interesting twists and turns in the different trial sagas. The case that the Icelandic Office of the Special Prosecutor is bringing against three Kaupthing managers and Olafur Olafsson, at the time Kaupthing’s second largest shareholder, is coming up in the Reykjavik County Court today. It seems that now all legal quibbles the defendants brought up have been dealt with – all of them brushed aside – which means that the case can now take its course. Not quite now though, that will happen in mid April when the main proceedings are due to start. The Kaupthing managers charged are Sigurdur Einarsson, Hreidar Mar Sigurdsson and Magnus Gudmundsson. This is by far the largest case brought so far by the OSP. There are fifty names on the witness list. One of them is the man who has given the case its name, Sheikh Mohammed bin Khalifa al Thani. The Sheikh is not accused of any wrongdoing and has not been charged but the OSP would like him to bear witness. It is not known if he will answer the request. This case has been extensively dealt with on Icelog, i.a. here. The interesting UK angle to the story is that there are striking parallels of this loan story – a Middle Eastern investor being lent money by a bank to invest in that same bank, which then uses that investment as a sign of its rude health – in the Barclay story, also from 2008, now being investigated by the SFO, also covered earlier on Icelog. Middle Eastern and Russian money is famously finding its way into many London-based investments and investment companies, adding glamour and building cranes to the city. The question is how sparkling clean and healthy all this money is – but as we know from the HSBC money laundering case even major banks are not too squeamish when it comes to the choosing their customers. The Office of the Special Prosecutor is indicting Kaupthing’s CEO Hreidar Mar Sigurdsson and Kaupthing’s chairman Sigurdur Einarsson for a breach of fiduciary duty and market manipulation in giving loans to companies related to the so-called ‘al Thani’ case; indicting Kaupthing Luxembourg manager Magnus Gudmundsson for his participation in these loans and Kaupthing’s second largest shareholder Olafur Olafsson for his participation. In addition, Olafsson faces charges of money laundering because he accepted loans to his companies without adequate guarantees. In September 2008 Kaupthing made much fanfare of the fact that Sheikh Mohammed bin Khalifa al Thani, a Qatari investor related to the Qatar ruler al Thani, bought 5.1% of Kaupthing’s shares. The 5.1% stake in the bank made al Thani Kaupthing’s third largest shareholder, after Olafsson who owned 9.88%. This number, 5.1%, was crucial, meaning that the investment had to be flagged – and would certainly be noticed. Einarsson, Sigurdsson and Olafsson all appeared in the Icelandic media, underlining that the Qatari investment showed the bank’s strong position and promising outlook. What these three didn’t tell was that Kaupthing lent the al Thani the money to buy the stake in Kaupthing – a well known pattern, not only in Kaupthing but in the other Icelandic banks as well. A few months later, stories appeared in the Icelandic media indicating that al Thani wasn’t risking his own money. More was told in SIC report – and now the OSP writ tells quite a story. A story the four indicted and their defenders will certainly try to quash. The story told in the OSP writ is that on Sept. 19 Sigurdsson organised that a loan of $50m was paid into a Kaupthing account belonging to Brooks Trading, a BVI company owned by another BVI company, Mink Trading where al Thani was the beneficial owner. Sigurdsson bypassed the bank’s credit committee and was, according to the bank’s own rules, not allowed to authorise on his own a loan of this size. The loan to Brooks was without guarantees and collaterals. This loan, first due on Sept. 29 but referred to Oct. 14 and then to Nov. 11 2008, has never been repaid. – Gudmundsson’s role was to negotiate and organise the payment to Brooks. According to the charges he should have been aware that Sigurdsson was going beyond his authority by instigating the loan. But this was only the beginning. The next step, on Sept. 29, was to organise two loans, each to the amount of ISK12.8bn, in total ISK25.6bn (now €157m) to two BVI companies, both with accounts in Kaupthing: Serval Trading, belonging to al Thani and Gerland Assets, belonging to Olafsson. These two loans were then channelled into the account of a Cyprus company, Choice Stay. Its beneficial owners are Olafsson, al Thani and another al Thani, Sheikh Sultan al Thani, said to be an investment advisor to al Thani the Kaupthing investor. From Choice Stay the money went into another Kaupthing account, held by Q Iceland Finance, owned by Q Iceland Holding where al Thani was the beneficial owner. It was Q Iceland Finance that then bought the Kaupthing shares. As with the Brooks loan, none have been repaid. These loans were without appropriate guarantees and collaterals – except for Serval, which had al Thani’s personal guarantee. After noon Wed. Oct. 8, when Kaupthing had collapsed, the US dollar loan to Brooks was sent express to Iceland where it was converted into kronur at the rate of ISK256 to the dollar (twice the going rate in Iceland that day) and used to repay Serval’s loan to Kaupthing – in order to free the Sheik from his personal guarantee. This is the scheme, as I understand it from the OSP writ. And all this was happening as banks were practically not lending. There was a severe draught in the international financial system. The Brooks loan is interesting. It can be seen as an “insurance” for al Thani that no matter what, he would never lose a penny. When things did go sour – the bank collapsed and all the rest of it – this money was used to unburden him of his personal guarantee. Otherwise, it would have been money in his pocket. It’s also interesting that the loan was paid out to Brooks on Sept. 19, his investment was announced on Sept. 22 – but the trade wasn’t settled until Sept. 29. This means that his “guarantee” was secured before he took the first steps to become a Kaupthing investor. Apparently, Kaupting’s credit committee was in total oblivion of all this. The CC was presented with another version of reality. Below is an excerpt from the minutes regarding the al Thani loan, discussed when the Board of Kaupthing Credit Committee met in London Sept. 24. 2008 (click on the image to enlarge). Three things to note here: that the $50m loan “is parts of the profits from the transaction.” Second, that al Thani borrowed €28m to invest in Alfesca. It so happens that Alfesca belonged to Olafsson. Al Thani’s acquisition in Alfesca was indeed announced in early summer of 2008 and should, according to rules, have been settled within three months. At the end of Oct. 2008 it was announced that due to the market upheaval in Iceland al Thani was withdrawing his Alfesca investment. Thirdly, it’s interesting to note that Deutsche bank did lend into this scheme – as it also did into another remarkable Kaupthing scheme where the bank lent money to Olafsson and others for CDS trades, to lower the bank’s spread; yet another untold story. According to the OSP writ, the covenants of the al Thani loans differed from what the CC was told. It’s also interesting to note that the $50m loan to al Thani’s company was paid out on Sept. 19, five days before the CC meeting. This fact doesn’t seem to have been made clear to the CC. The OSP writ also makes it clear that any eventual profits from the investment would have gone to Choice Stay, owned by Olafsson and the two al Thanis. Why did al Thani pop up in September 2008? It seems that he was a friend of Olafsson who has is said to have extensive connection in al Thani’s part of world. Olafsson’s Middle East connection are said to go back to the ‘90s when he had to look abroad to finance some of his Icelandic ventures. London is the place to cultivate Middle East connections and that’s also where Olafsson has been living until recently. It is interesting to note that the Financial Times reports on the indictments without mentioning the name of Sheikh al Thani. The four indicted Icelanders are all living abroad. Sigurdur Einarsson lives in London and it’s not known what he has been doing since Kaupthing collapsed. Hreidar Mar Sigurdsson lives in Luxembourg where he, together with other former Kaupthing managers, runs a company called Consolium. His wife runs a catering company and a hotel in Iceland. Magnus Gudmundsson also lives in Luxembourg. David Rowland kept him as a manager after buying Kaupthing Luxembourg, now Banque Havilland, but Rowland fired Gudmundsson after Gudmundsson was imprisoned in Iceland for a few days, related to the OSP investigation. In the Icelandic Public Records it’s said that Olafsson lives in the UK but he has now been living in Lausanne for about two years. In Iceland, he has a low profile but is most noted in horse breeding circles, a popular hobby in Iceland. He breeds horses at his Snaefellsnes farm and owns a number of prize-winning horses. Following the indictment, Olafsson and Sigurdsson have stated that they haven’t done anything wrong and that the al Thani Kaupthing investment was a genuine deal. The case could come up in the District Course in the coming months. But perhaps this isn’t all: it’s likely that there will be further indictment against these four on other questionable issues related to Kaupthing. *The OSP indictment, in Icelandic. **Does it matter that the four indicted are all living abroad? When I made an inquiry at the Ministry of Justice in Iceland some time ago whether Icelanders, living abroad but indicted in Iceland, could seek shelter in any country in Europe by refusing to return to Iceland I was told they couldn’t. If an Icelandic citizen is indicted in Iceland and refuses to return, extradition rules will apply. In this case, Iceland would be seeking to have its own citizens extradited and such a request would be met. – It has been noted in Iceland how many of those seen to be involved in the collapse of the banks now live abroad. It can hardly be because they intend to avoid being brought to court – they would have to go farther. Ia it’s more likely they want to avoid unwanted attention. For those with offshore funds it might be easier to access them outside of Iceland rather than in a country fenced off by capital controls.